The Christmas holidays have been great, lots of rushing around and family events. I'm not going to leave my shopping so late next year. Really. Anyway after everything it's been so nice to have a few sleepy days with Bradley still off work. He's been knitting his first sweater. I've been working on a few crafts projects including finishing the yarn I was making for Bradley to use to knit him some warm socks. I didn't manage to finish it in time for Christmas. He's been reproachfully walking around in bare feet. But the yarn is all spun now! I'll post that soon. Pictured here is one of my new favourite treats, a Lily Spindle I bought some time ago which arrived just before Christmas. I couldn't wait to do a little spinning with it so I've been using some of the fibre I got from Kristyn (Pleasurecraft) at City of Craft. Here's a close up picture of the top, it has lovely detail and the scallop flower shape is perfect for holding the yarn in place. I also love the open style of the hook. It's made of olive wood from the pruning of the trees planted by the Romans 2000 years ago. They still produce olives and Gilbert Gonsalves purchases the prunings with no damage to the trees. This one is 3/4 ounce which is for lace weight and a little bulkier. 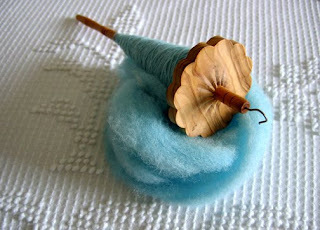 I'm still working out how to choose the weight of spindle to use (and which weight to spin) for various fibres. Generally I've just been trying out lots of things. For example, this fibre is Cheviot. It's crimpy and springy. I'm guessing that spinning it this fine isn't what you would usually do, but it's turning out really nicely. It feels softer when spun for some reason. I also think the spindle is a bit lighter than you might normally use for this type of fibre, but I couldn't wait to try it. 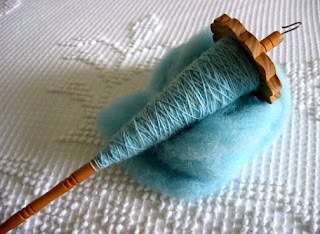 The fibre is a pretty robin's egg blue, an icy blue, and I think it will be perfect for our new tea cosy! and, i read somewhere that women are conditioned to like robin's egg blue. 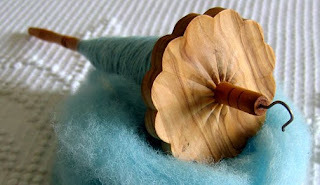 what a gorgeous spindle. happy new year to you!